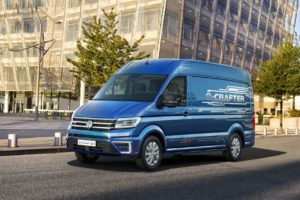 Volkswagen Commercial Vehicles (VWCV) is the UK’s second best-selling LCV brand, with a portfolio of vans ranging from the compact Caddy to the 3.5t Crafter, along with multiple conversions. Transport News Brief caught up with the brand’s Director, Carl zu Dohna, to talk about the sector and what VWCV is up to in the near future. What are the challenges and opportunities for the LCV sector over the next 2-3 years, and how is VWCV preparing for them? In the past it was enough to build and sell great vehicles. 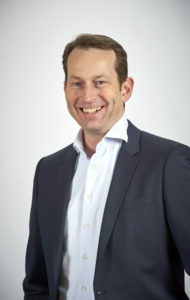 We are now in a fast-paced world and need to see ourselves as a provider of mobility solutions for our customers. As their businesses evolve, we need to evolve. And we’re doing it: preparing for the arrival of electric vehicles across our range to allow customers to respond to low emission zones and the challenges of operating LCVs in cities; opening extended hours across our network and increasing our mobile servicing offering because our customers need support beyond 9-5; developing smart digital solutions from vehicle configurators and finance calculators, through online service booking to live chat; to name but a few. It’s exciting, the challenge is to understand their business and their future requirements; the opportunities come from living up to our brand’s Working With You promise and building bespoke packages and solutions for each and every commercial vehicle operator. You recently announced a strategic alliance with Ford. What benefits will this bring to the market and to VWCV’s products? Efficiencies of scale will come from the co-development of products, but also in collaboration on autonomous vehicles, mobility services and EV. We’re in an era of rapid change and this alliance will boost competitiveness and allow us to serve customers better. What do you think the biggest developments in the LCV market will be over the coming months and years? There’s no doubt there’ll be an increase in the sales of electric vehicles to respond to policy changes – and this will also bring a change in use. Fleets will start to look for smarter last mile delivery solutions for example, matching a vehicle to a requirement rather than a broader ‘one size fits all’ policy. We’re also likely to start to see a change in ownership models with customers wanting vehicles when they need them. I think it’s important to think about the macro trends as well: what are consumers demanding? And in turn what will our customers demand? What is the government calling for? We have to be ready to react to these changes with a great suite of products and support packages, a stable and professional network, and a team of forward-looking people who aren’t afraid to adapt a model which has been in place for many years. Where does VWCV see its opportunities to grow and develop the business? Our Engineered for You and Engineered to Go conversions – largely on Crafter but also on Transporter and Caddy – offer us new opportunities in market sectors where our sales have not matched our overall performance. I’m talking not only in the traditional Luton, dropside and tipper markets, but for example in emergency vehicles, home delivery and refrigerated conversions, breakdown and wheelchair access. We also have opportunities to do more with Caravelle in taxi and chauffeur transport. Last year we also grew our share of the Motability market with products including the Shuttle. Plus, as I’ve said earlier, there’s profitable growth to be gained from a suite of support and aftersales products, as well as in used vehicles. With the Engineered for You range of conversions, are we likely to see more off-the-peg conversions in the near future and if so what types of vehicle are they likely to be? Yes – our new recognised converter scheme is running well now and a real focus for the network. 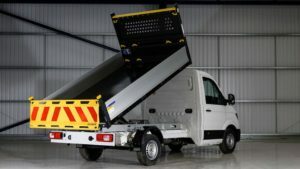 We’ve just launched a new range of Engineered to Go Luton, dropside and tipper, and a refrigerated van and minibus will be on sale around the middle of the year. What about EVs – is there a plan to sell more of VWCV’s E-models in the UK, and how will they come to market? Yes – at the IAA in September we showed an electric Caddy, Transporter and Crafter as well as the ID Buzz Cargo and eCargo Bike. The first to come will be the ABT eCaddy, developed in co-operation with ABT, followed by the Crafter and ABT eTransporter in 2020/1 and ID Buzz products from 2022. The collaboration with ABT is a great way to be able to bring electric products to market quickly and cost-effectively; longer term with new generations of vehicles we’ll be able to benefit from the Volkswagen Group’s MEB electric platform as well. They will be sold through our traditional network, and we’re working with our Van Centres now to make sure they’re ready to sell and service EVs. It’s not just about importing the vans – our customers, network and wider team also need to be prepared. How important is the CV Show to VWCV? It’s a really important date in the calendar and we’re looking forward to being there again this year. We returned to the show three years ago after an absence and it’s been hugely successful. Our ‘house’ concept provides the perfect backdrop to meet and do business with customers. We’ve sold vehicles and set up long term fleet partnerships as a direct result of being at the show – what could be more important? What is VWCV doing to ensure its retail and service network is positioned for the future, both in terms of customer support and dealer development and training? Over the past few years we’ve reviewed our entire people strategy, to make sure we attract, develop and keep the right forward-looking people to make our dedicated Van Centre network viable and successful for the short, medium and long term. At the top end we’ve had a big focus on leadership, with new programmes in place for senior and emerging leaders, and at the other end we’re boosting our apprentice intake to make sure we ‘grow our own’ as we know this is a great way to develop future talent. We’ve also refreshed all our qualification paths and are using more efficient and engaging training methods such as online and remote modules, as well as face-to-face. Ultimately, our people are key to our future success: and this will come from entrepreneurial leaders with an eye on the changing market and a willingness to respond and innovate.